Thanks to All Saints for gifts and prayers. Pastor Patrick from Kenya would like to thank All Saints for their on-going gifts and prayers. 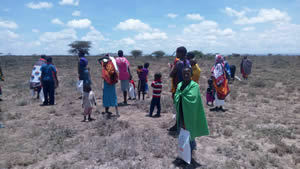 There has been no substantial rain in Kenya since last June and so the people are growing weak from a lack of food.The Masai people keep cattle and rely on the milk for food and to sell in exchange for other food. Because the ground is so parched many animals have died and the few that are still alive cannot produce milk. Pastor Patrick is pastor of 2 Masai villages and he is trying to supply them with food because the government is not doing anything. 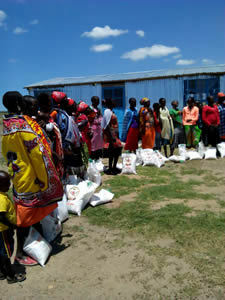 There are about 60 families in each village and with our gifts he was able to provide 22 families with rice, maize and beans for 2 weeks and last week another church in north London gave a gift which enabled him to buy food for 3 villages for another week. 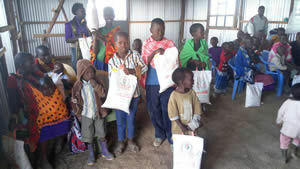 Please continue to pray for rain and supplies for the Masai villagers.